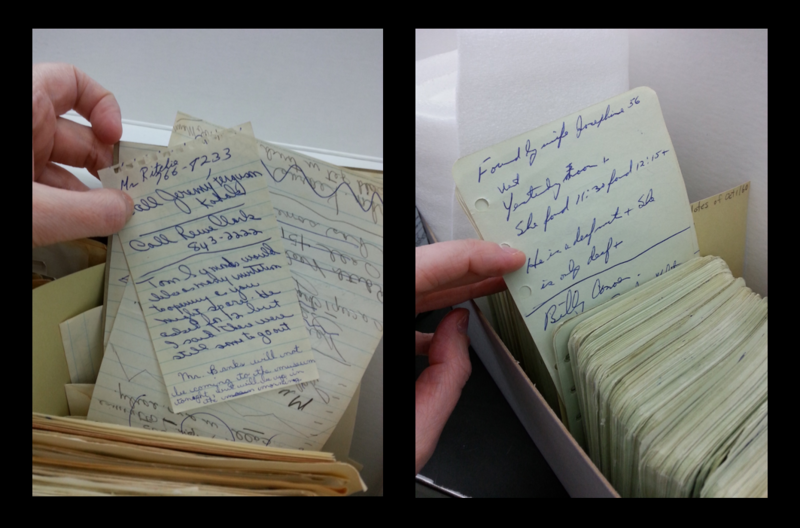 Over this past year one of our special projects here in the Peel Archives has been to undertake a complete physical inventory of our holdings. 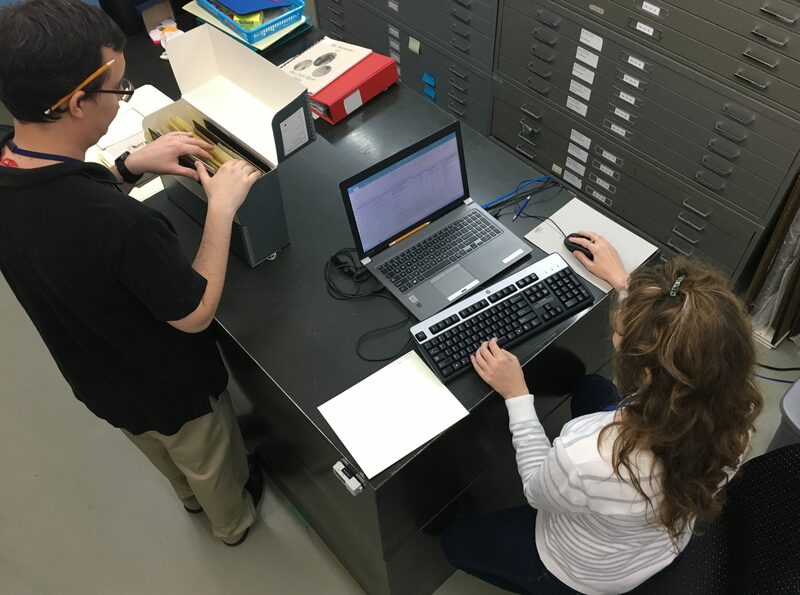 Archivists Kyle and Samantha have been pulling every single box off the shelf to go through it, recording in a spreadsheet a wide range of information, including file titles, date ranges, physical descriptions, and record creators. As our holdings cover several kilometres of linear shelving, this is a big job. Why are we doing this? The Region of Peel Archives has gone through many changes in the decades since its founding. During that time records have been moved around between different facilities and archival practices and staff training have standardized and improved. As a result, we were left with some vague or rudimentary archival descriptions, incomplete database entries, outdated or mislaid finding aids, and sometimes, misfiled material. The detailed data produced by this inventory is going to be used as the backbone of a new collections management database currently in the planning stages. This database will allow archivists to digitally document our collections according to archival standards; it will also allow the public to search our collections online. This inventory is also assisting us in the crucial task of identifying priority fonds and collections for more rigorous archival description or redescription or conservation work. The project (which is still ongoing) has been a success, although it is taking a bit longer than initially projected. 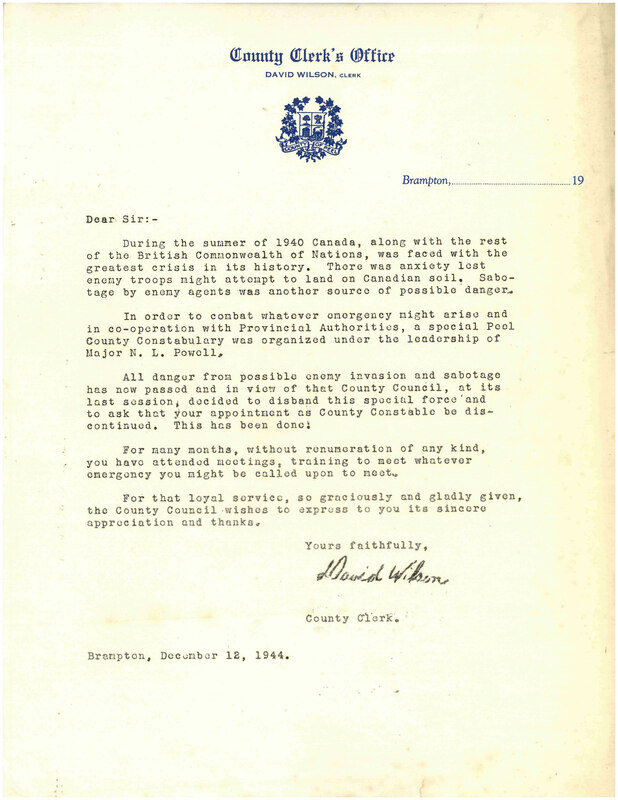 Part of this success lies in the range of interesting material that we have been able to personally rediscover and highlight; some of these records have since been featured in The Mississauga News and The Brampton Guardian in the “Throwback Thursday” columns contributed by our colleague, Nick Moreau. Some of our personal favourites from the inventory project thus far include the following records. 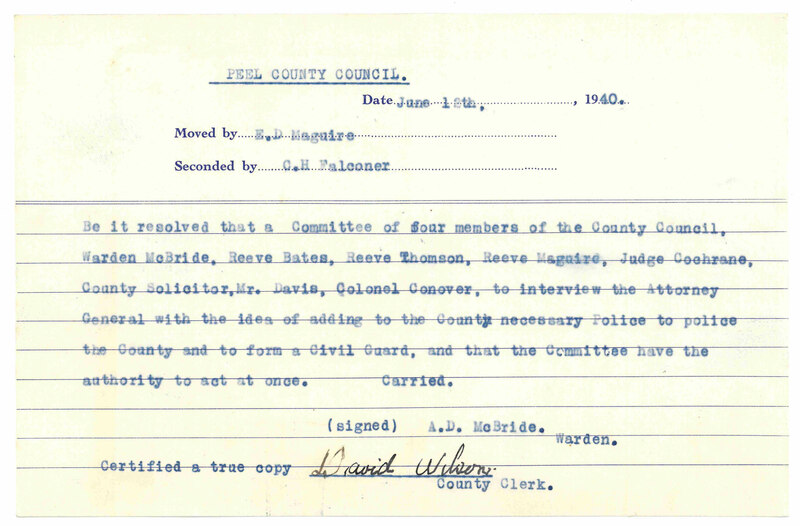 Readers of our blog may recall that one of my favourite groups of records in our holdings are the Toronto Township “benchmark book” photographs found within the Township of Toronto fonds. 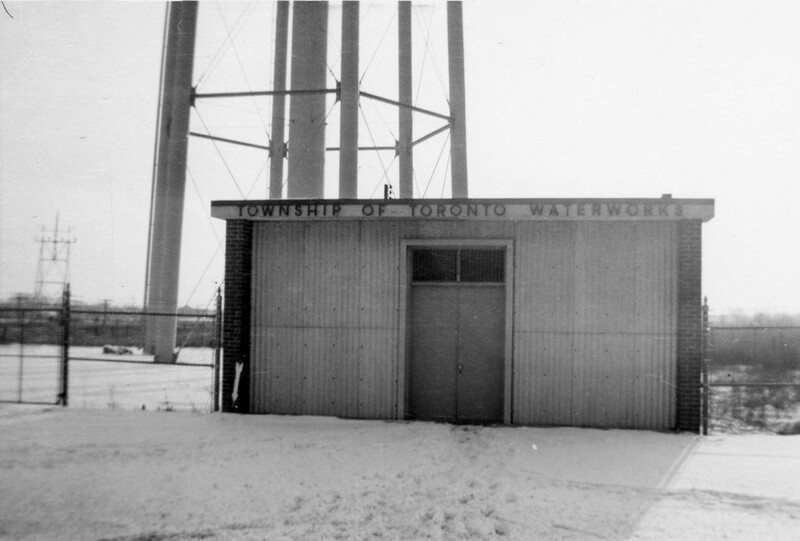 These 285 glorious black and white photographs were created by the Township of Toronto Planning Department in 1957 in order to document the location of small metal plaques known as “benchmarks” found throughout the township. The benchmarks, which were located on various buildings and structures, were used by planning staff to assist in situating other municipal projects (white or black arrows point to the benchmarks in the photographs). Until recently we had to rely on the at times confusing descriptions of the locations to situate each photograph, i.e. 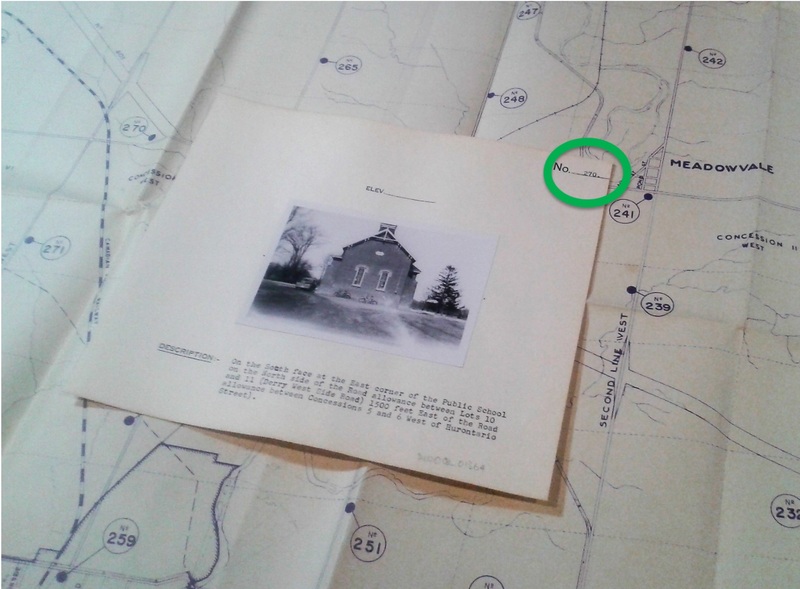 “on the south face two feet west of main entrance of the red brick school on the north side of the road allowance between lots 10 and 11, 200 feet east of Hurontario Street.” However, now we can easily determine exactly where each photograph was taken, as we have found, within the planning files of the County of Peel engineer (in the County of Peel fonds), the benchmark index map! The circled numbers on the map refer to the numbers assigned to each photograph, as shown. 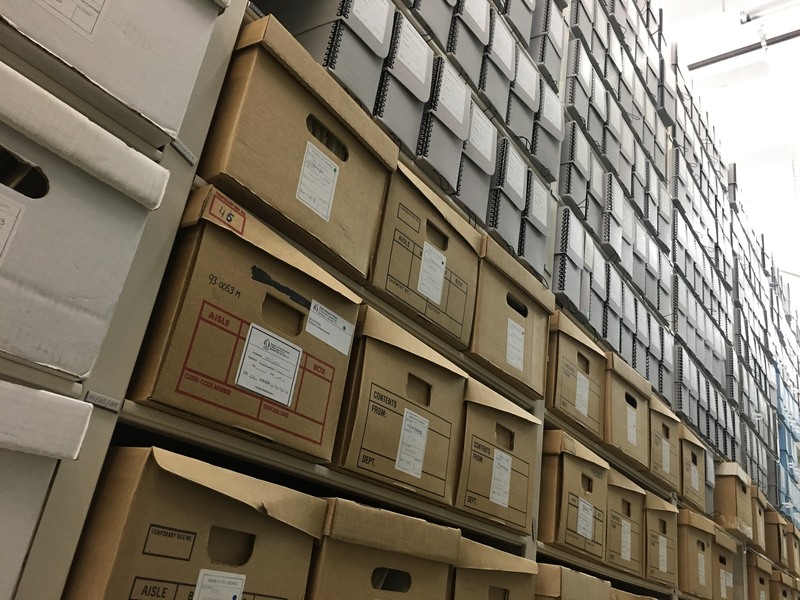 This discovery reinforces the value of a Regional record program wherein the surviving archival records of all the area’s past and present municipalities are preserved and utilized together. 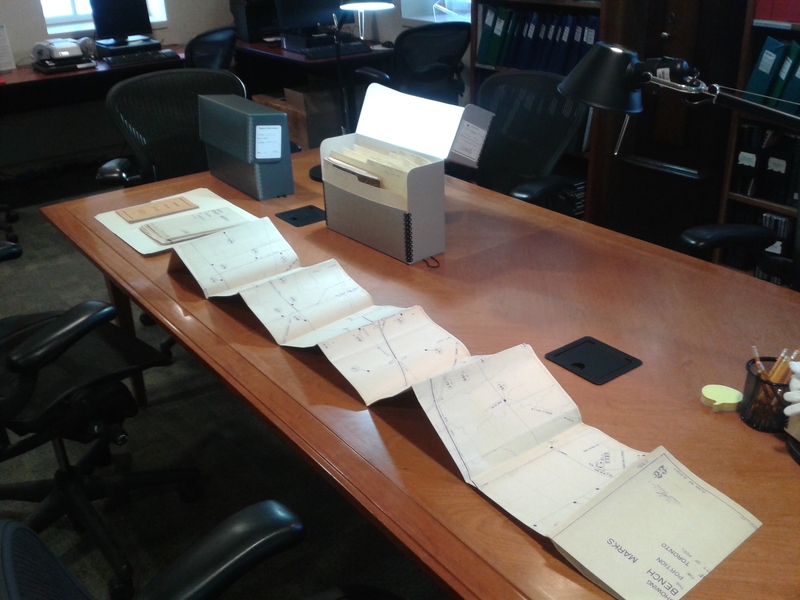 Here we see that records kept in two separate municipal fonds are of more use and value when brought together. During the Second World War Peel’s politicians were naturally worried about the possible threat from enemy forces, spies, and saboteurs. However, I was not aware of any records here to do with wartime defence planning on the Peel homefront until recently when we came across a box of records maintained by the County of Peel clerk dealing with the “civil guard.” The clerk’s civil guard papers document the creation and operation of the “Peel County Special Constabulary for Civil Guard” an organization in operation from mid-1940 to December 1944. 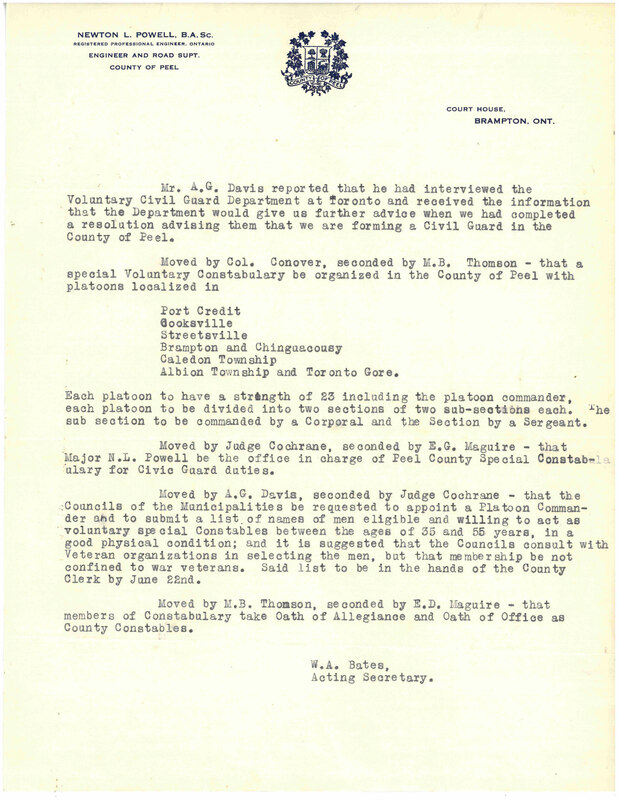 This organization, authorized by the Province’s Attorney-General, was comprised of platoons of men between the ages of 35 and 55 stationed in Port Credit, Cooksville, Streetsville, Brampton, Chinguacousy Township, Caledon Township, Albion Township, and Toronto Gore Township. They were to remain vigilant with regard to any possible threats to the peace and security of the area. 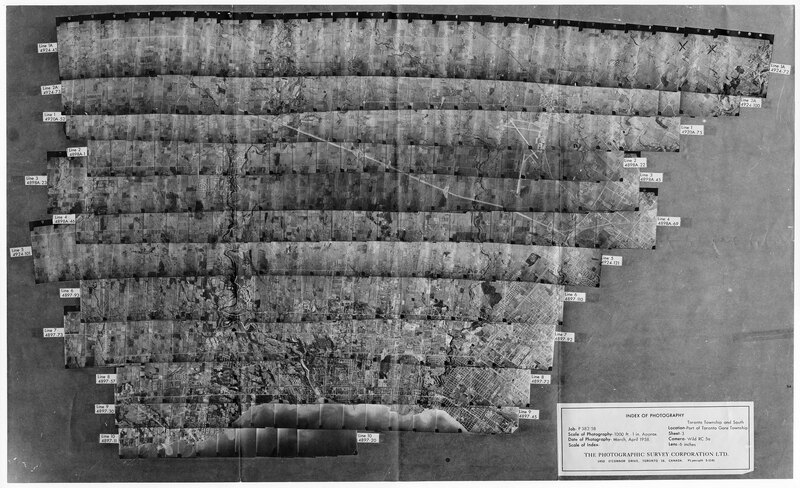 This fascinating and aesthetically interesting composite photograph was found within the project files of the Township of Toronto planning department (now the City of Mississauga planning department). Comprised of ca. 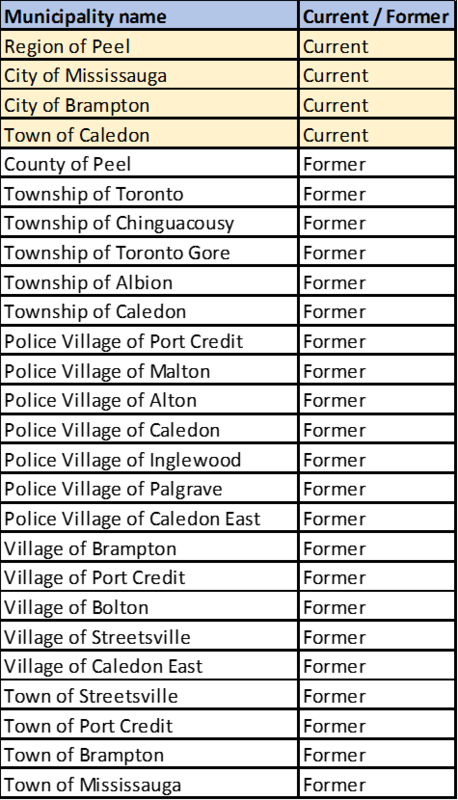 170 separate aerial photographs taken in March and April 1958 and then stitched together, the composite covers the Township of Toronto and the southern portion of the Township of Toronto Gore (which had been annexed by the Township of Toronto in 1952). Of particular interest is the fact that these photographs were taken as Highway 401 was being built through the Peel area. When this photograph was taken the highway had only been built as far as Mississauga Road, just north of the expanding Village of Streetsville. 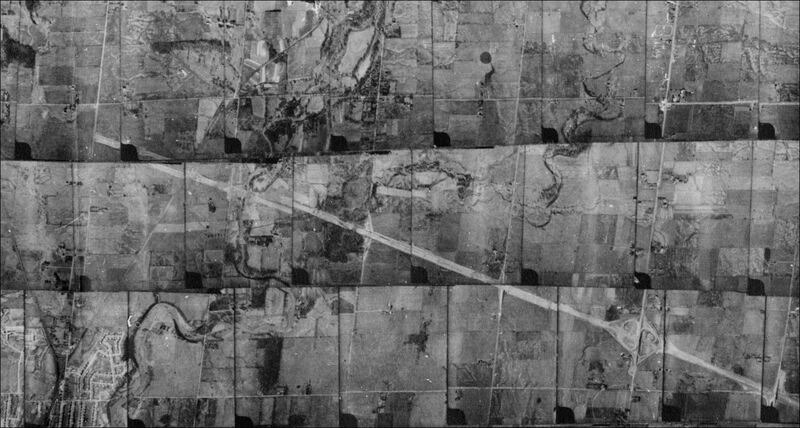 Before this composite was discovered the oldest aerial photographs we had of the Mississauga area dated to 1963. 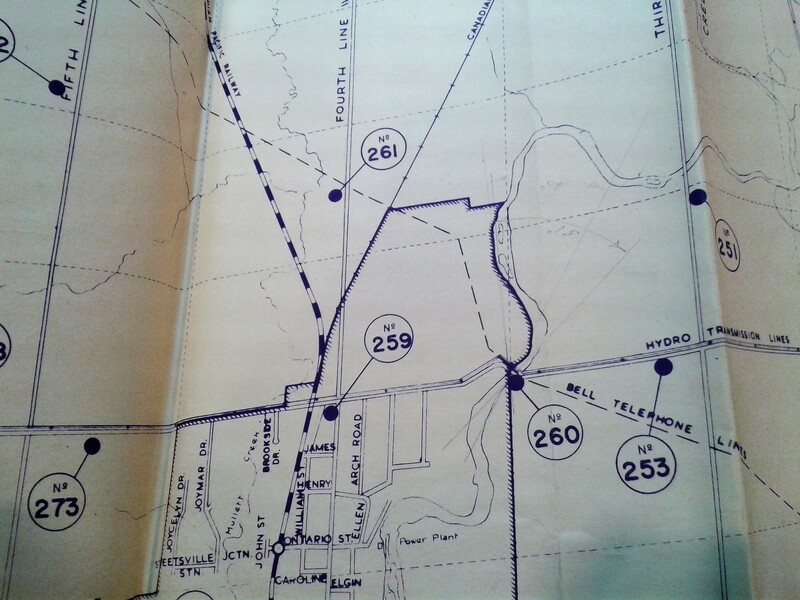 That said, the City of Mississauga has 1954 aerials of the Mississauga area available through their maps service online. We recently found that we have letters from the Civil War in the US. Jacob Cook, after whom Cooksville in Mississauga is named, was an American immigrant. Of his family who remained in the states, two nephews went on to join the Union Army. 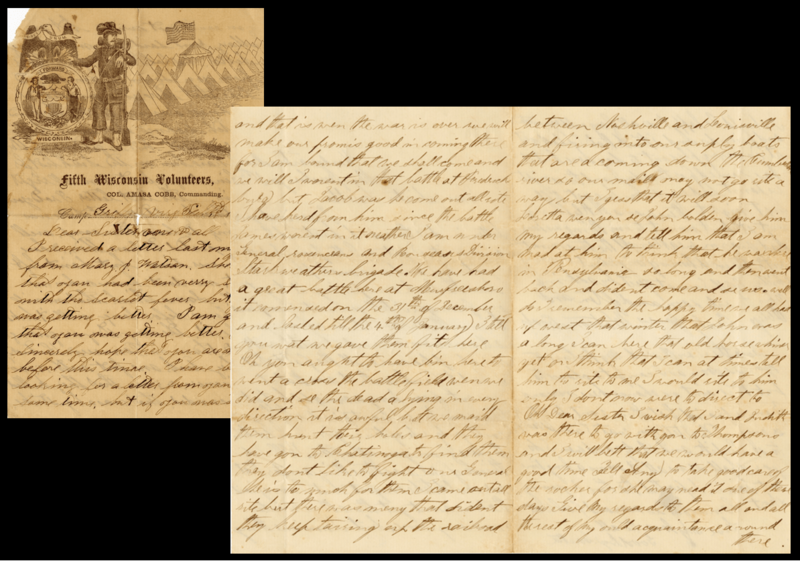 In 1862 and 1863 they sent these letters to relatives in Ontario; the letters then found their way into other Cook family papers in the archives. Among other events, the letters relate an eyewitness account of the Battle of Stones River in which there were over 24,000 causalities. Although we primarily collect material related to Peel, we thereby also become the stewards of records from all over the world – simply because people are connected with one another. We have had a great battle here at Murfreesboro. It commenced on the 31st of December and lasted till the 4th of January. I tell you wot we gave them fits here. Oh you ought to have bin here to went across the battle field wen we did and see the dead lying in every direction. It is awful but we maid them hunt their holes and they have gon to Chatinoga to find them. They don’t like to fight our General. He is to much for them. I came out all rite but there was meny that dident. They keep tairing up the railroad between Nashville and Louisville and firing into our suply boats that are coming down the Cumberland river so our mail may not go rite away but I gess that it will soon. Before the inventory project began, we already knew that the Region of Peel Archives houses great resources for studying the history of newspaper journalism and photojournalism in the 20th century predigital period; for example, we have extensive photo “morgues” from several high circulation newspapers. But until we went though some boxes in more detail we didn’t appreciate the textual material that sheds further light on how journalism was practiced in this period. 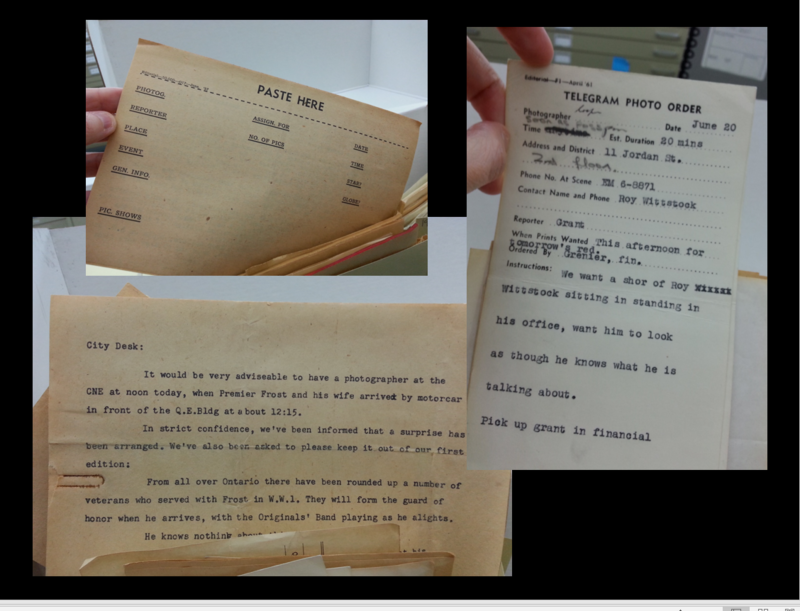 For example, among the work of other journalists we have the papers of Russ Cooper who worked for the Toronto Telegram and the Brampton Conservator among other papers. Cooper’s papers contain a great variety of material of a type that often didn’t survive: pages from the requisite little notebooks that journalists were never without, assignment sheets, multiple drafts of copy reporting on events both momentous and mundane, as well as all the ephemera that went into reporting such as press passes and information packages. We also found a copy of a speech Cooper gave where he describes what it was like to live the life of a newspaper journalist. Together these resources show us journalists and editors wrestling with standards of truth and evidence, and with their role in informing society – all themes very much on our minds in 2018. 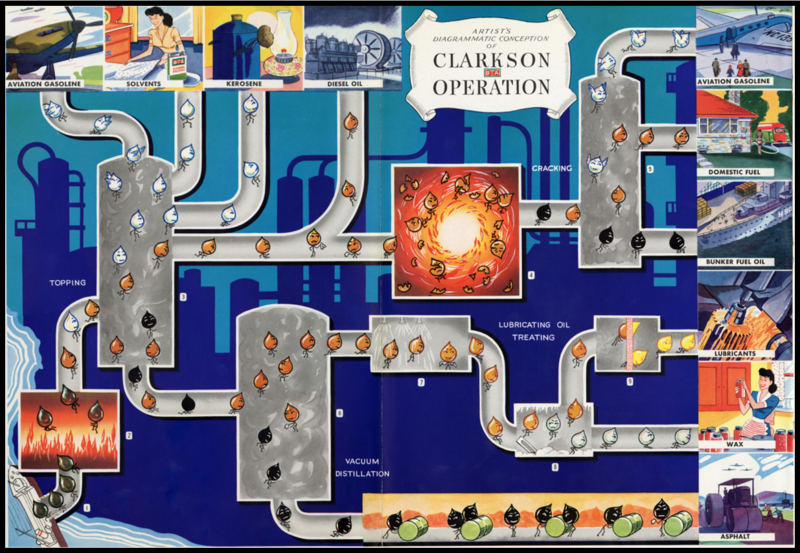 The Clarkson Oil Refinery was a landmark of the neighbourhood we moved into on our arrival from England when I was a child. At night it transformed from a vast grey tangle of towers into a fairy palace lit up by a million lights. Ships arrived at its docks on the shore of Lake Ontario from places far away. If this sounds like a child’s romantic view of a gritty industrial complex, we in the archives have found an almost equally romantic view for adult consumption. The inventory project uncovered this pristine copy of the booklet British American Oil issued on the opening of the refinery in 1943 (the only copy we know of in public hands). The refinery was partially constructed as a contribution to Canada’s war effort. 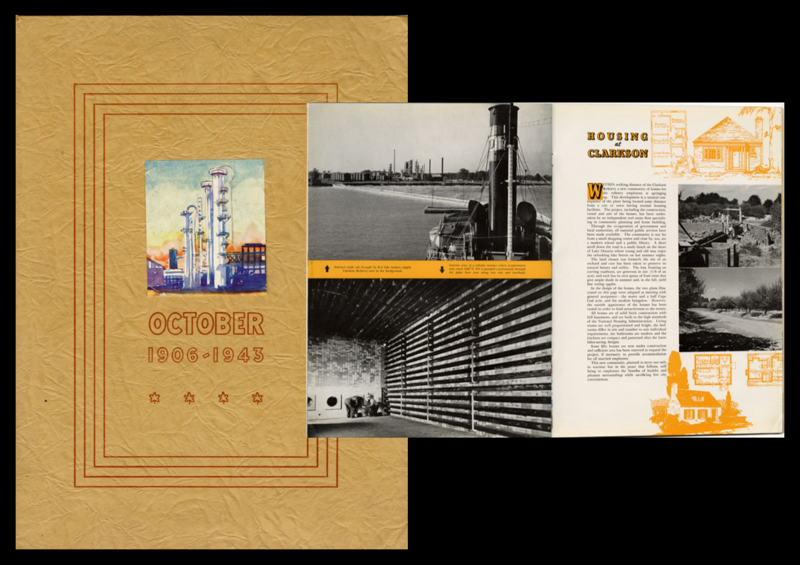 The aesthetic quality of the booklet – the pastoral colours, the tone of the prose – reveals an industry presenting itself to the community as friendly benefactor. This reminds me of how archival records speak to us in ways their creators may never have considered. Here we learn about the science and technology of the 1940s, about wartime housing, and about the self-understanding of a coporation. We plan on keeping our readers and users informed as we continue to move through this critically important inventory project. What a rare and important opportunity to inventory the holdings. Now there is no reason to call a retired archivist with a ‘do you remember’ question — although I’m always delighted when you do! This is such a great collection – can’t wait for further descriptive projects. No one will ever replace the human memory, especially given that it’s enhanced by powerful personal associations which you have in spades. We’ll always need you so don’t go away!